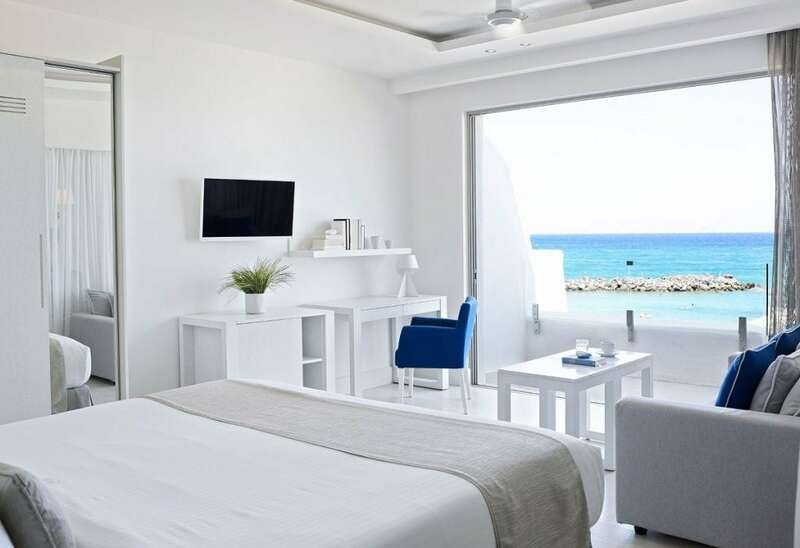 Knossos Beach Bungalows Suites Resort & Spa is a five-star hotel in Heraklion, Crete Island located in one of the most popular beaches of the Cretan Sea, in Kokkini Hani, on the seashore, constituting a trademark for the tourist map of the area. 10 km from the airport of Heraklion, 15 km from Hersonissos, 500 m from the center of the tourist village of Kokkini Hani. Sandy in the form of 2 coves. The entrance to the sea is sandy, in some places stones. 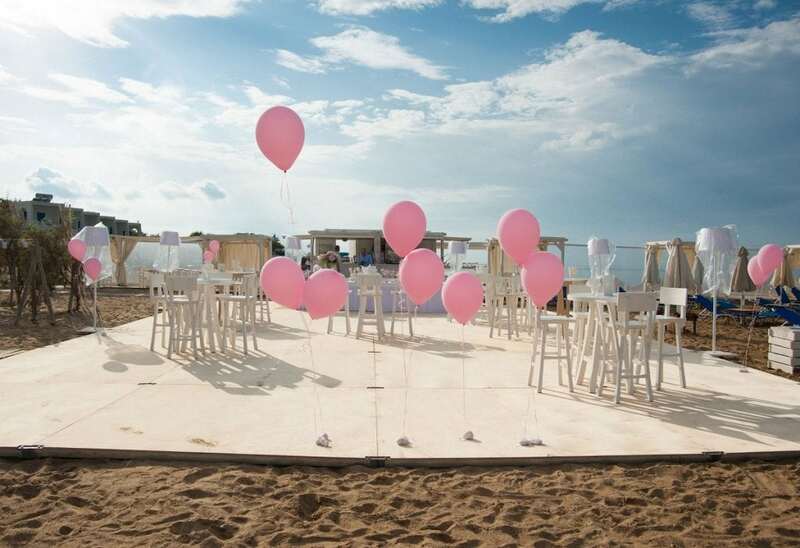 On the beach for hotel guests, umbrellas and sun beds are free of charge. Located in the main building of the hotel and constitute an accommodation choice that will vindicate you 100%. Enjoy an elegant setting with discreet luxury, modern facilities and amenities that will make every moment of your stay an unforgettable experience. 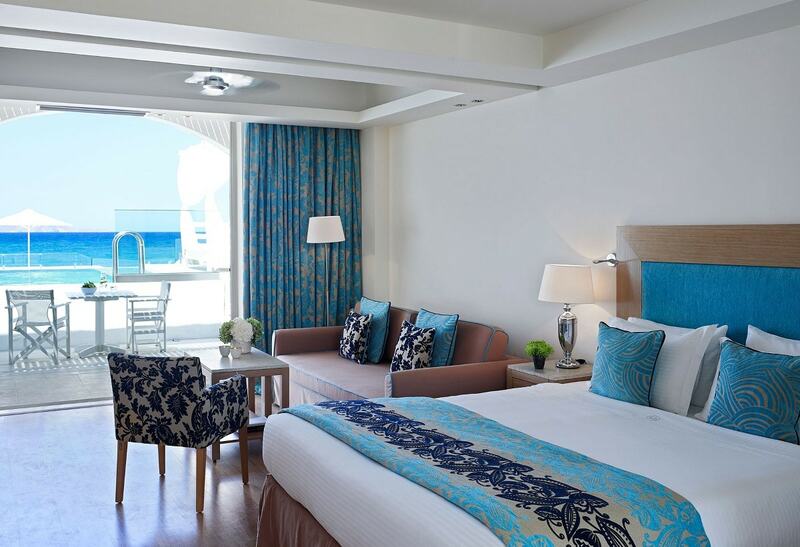 The Standard Rooms of the hotel feature one bedroom, bathroom with bathtub or shower and balcony. 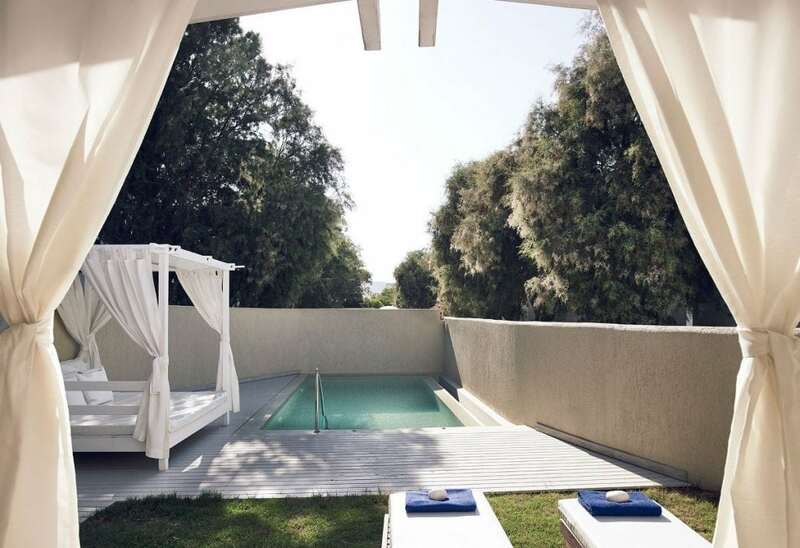 The Bungalows Garden View of Knossos Beach in Heraklion are situated in a convenient location overlooking the garden and is an accommodation choice that fully and by far meets the standards of summer. They feature one bedroom, bathroom with bathtub or shower and a large terrace with a settee over the long sandy beach. 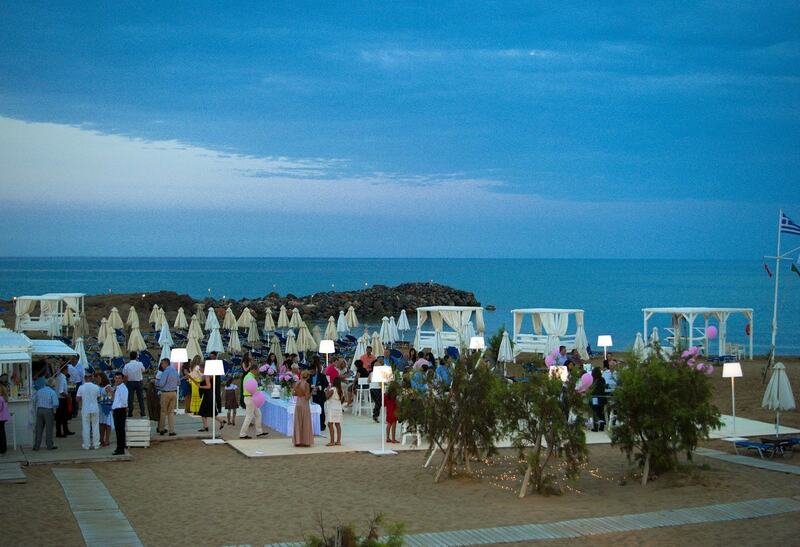 Indulge in a beautiful summer environment and enjoy every moment of your vacations. The Bungalows of Knossos Beach in Heraklion are located on the seafront or overlooking the sea and is an accommodation choice that fully and by far meets the standards of summer. 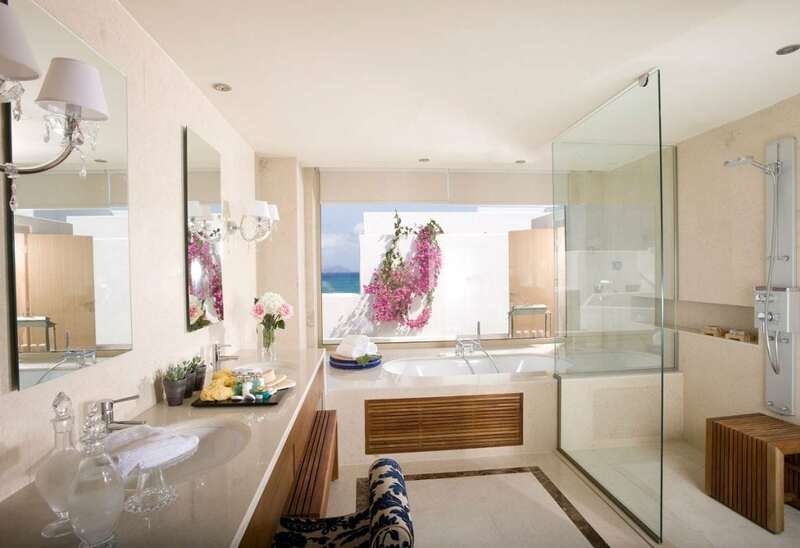 They feature one bedroom, bathroom with bathtub or shower and a large terrace with a settee over the long sandy beach. 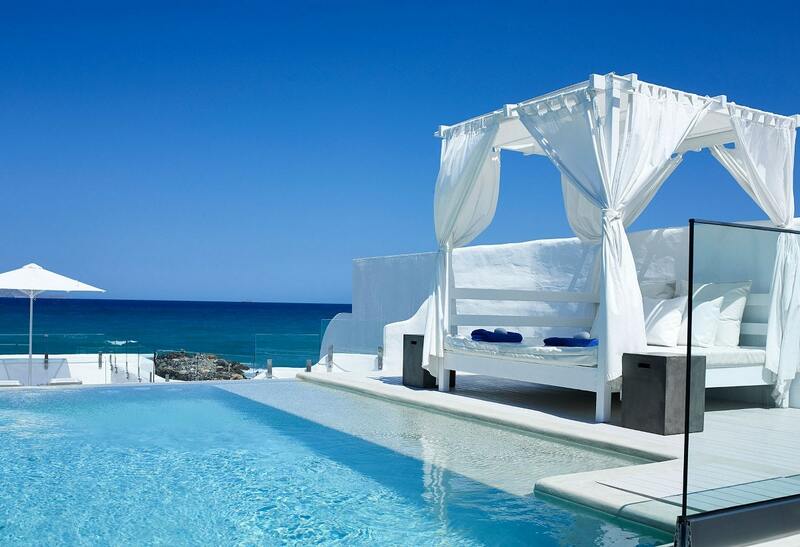 Indulge in a beautiful summer environment and enjoy every moment of your vacations. 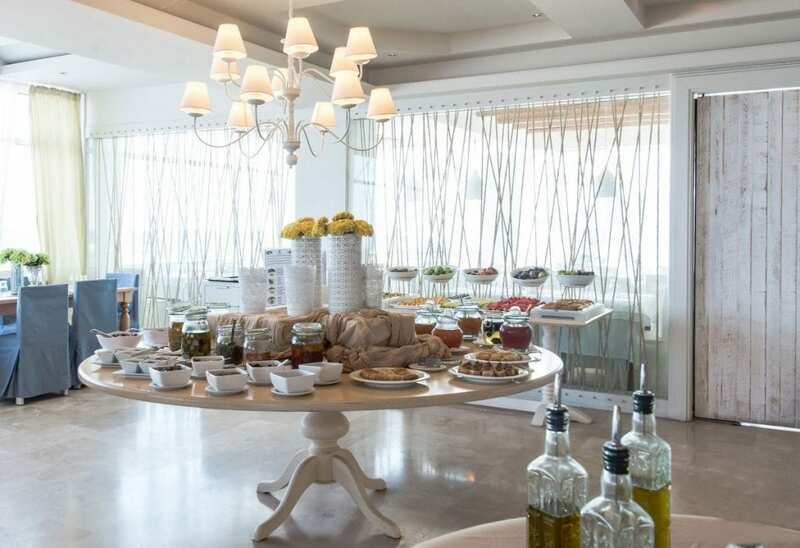 Sit back comfortably in the beautiful lounge or on the sun-lounges of the large wooden deck terrace (20sq.m.) under the shade of the private umbrella. 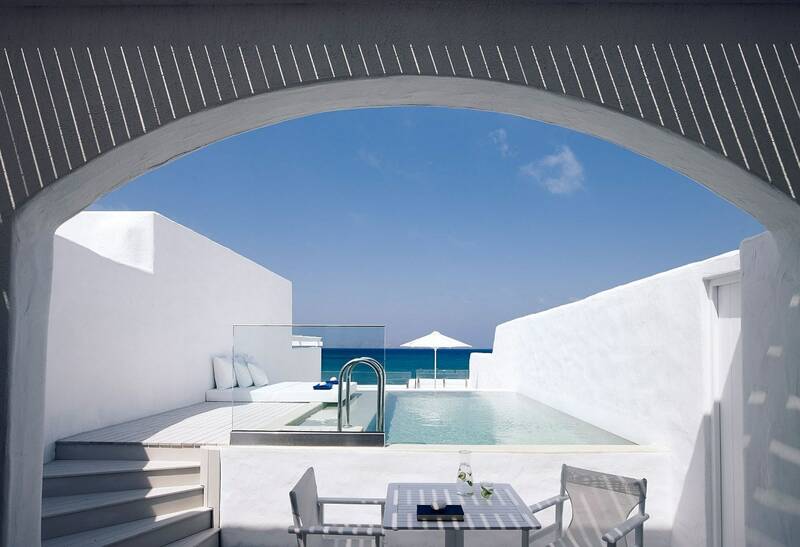 Chill out and gaze the panoramic view of the endless blue. The Superior Bungalows of Knossos Beach, in Heraklion Crete, are elegant and built on the seafront and have traditional architecture and feature: a bedroom with king size bed 180x210cm (72″ x 83″) and a bathroom with bathtub or shower, telephone, natural lighting and air flow, deluxe toiletries, make up mirror and hairdryer. 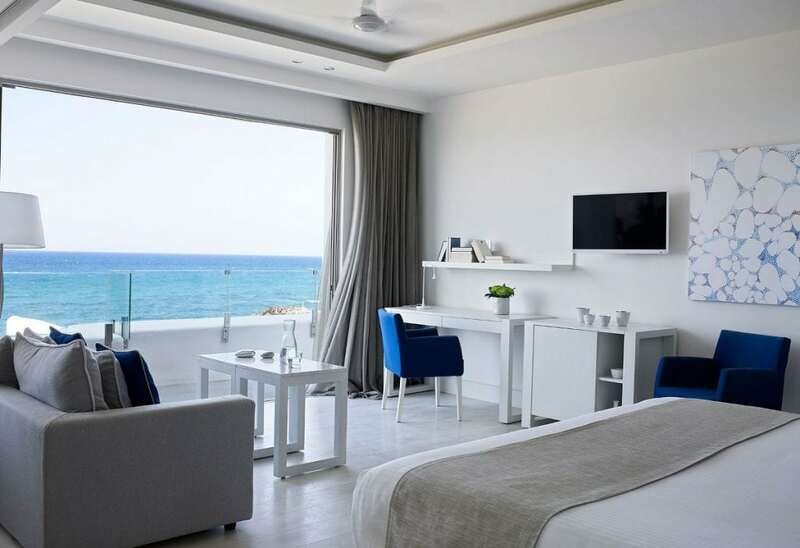 Built just 20 meters from the beach of the hotel, the Junior Bungalow Suites of Knossos Beach in Heraklion Crete epitomize an elegant luxury summer with modern furniture and tasteful fabrics with warm colors. Some suites feature a private patio with open-sky shower spacious terrace with entrance door that provides privacy for the guests. 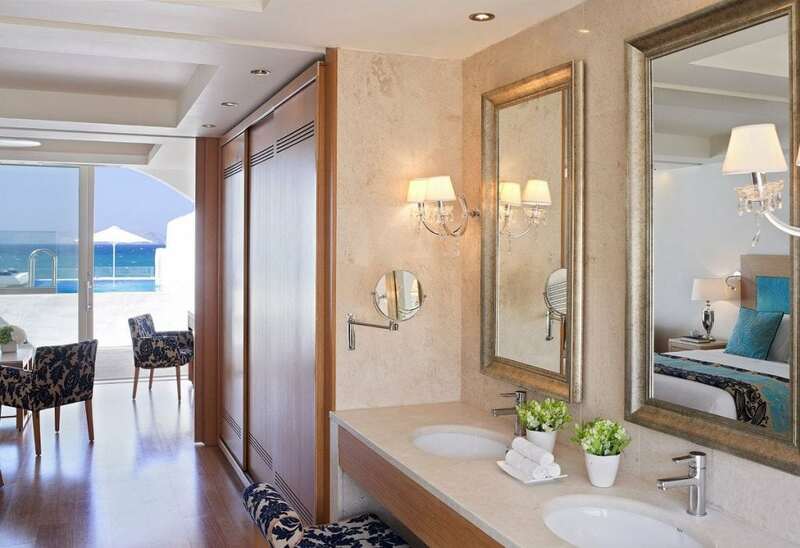 The suites feature a bedroom with king size bed 180x210cm (71″ x 83″), living room (some include a sliding door to separate it from the bedroom), terrace overlooking the sea, entrance door and garden furniture. Possibility of reservation of interconnecting suites with interconnecting door turning them into comfortable villas of 85 sq.m. The marble bathroom is equipped with: Bathtub or shower- with hydro-massage shower, most of them include open-sky shower οn the patio, twin vanities, separate toilet room with washbasin & shower, wall-to-wall window over the bathtub for natural day light, natural marble floor, electric roller, heated towel rack, telephone, natural lighting and air flow, luxury toiletries, bathrobes & slippers, make-up mirror and hairdryer. 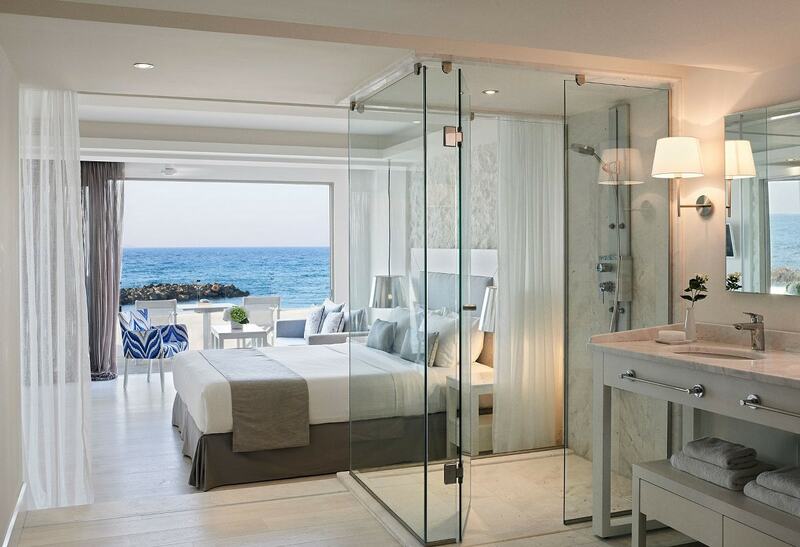 If you chose Crete for your summer holidays and you are lovers of the elegant Aegean style, the Island Suites of Knossos Beach in Heraklion Crete located on the seafront is the option that suits you. Functional and luxury with spectacular uninterrupted sea views, they offer a Cycladic ambience to your stay, as precious holiday moments require so. They feature a master bedroom with king size bed 180cm X 210cm, 71″ x 83″, and open-plan living room with folding sofa. Most Suites can be interconnected in pairs to accommodate the stay up to four adults and two children. 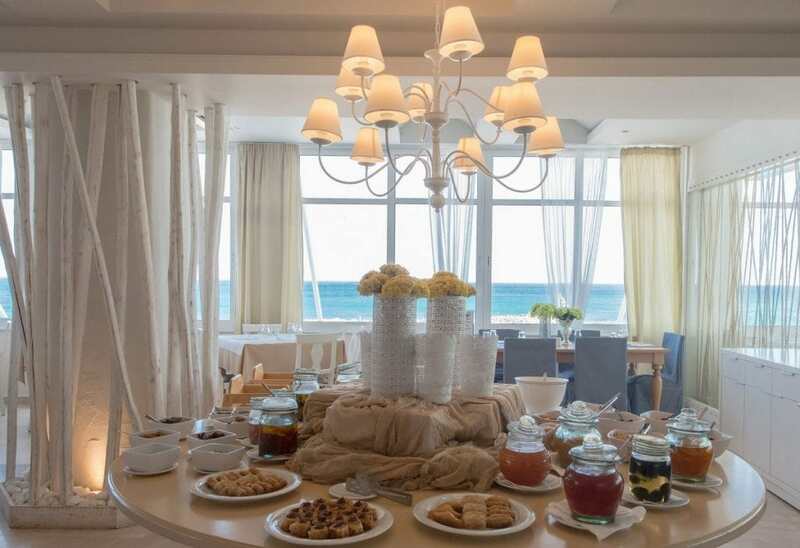 The Family Suite consists of two Junior Bungalow Suites with connecting door The Grand Suite consists of two Island Suites with connecting door The Sea view 2-bedroom Spa Suite with private pool consists of the Sea view Spa Suite with private pool and a Junior Suite.